Before U.S. presidents came into his comic crosshairs, Lorne Michaels staged University of Toronto productions poking fun at campus life. At a U of T event in New York City Monday for American students, the man behind Saturday Night Live looked back on his undergraduate years and answered questions from prospective students on topics ranging from the university to SNL and the state of U.S. politics. Michaels, born Lorne Lipowitz, graduated from U of T in 1966 after an undergrad career that included writing for and directing the student troupe UC Follies and Hart House Theatre. He returned to U of T to shoot the movie Mean Girls and in 2002 he was back in Convocation Hall to accept an honorary degree. 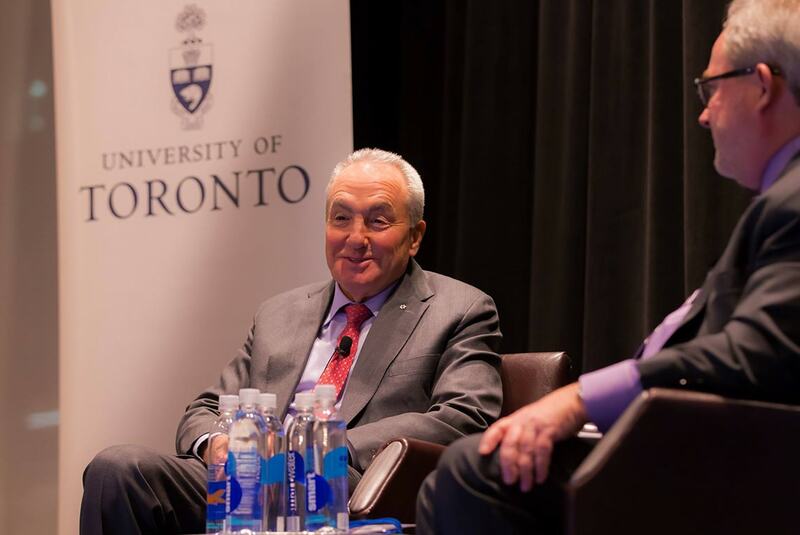 Speaking to American students who are considering making the move from the U.S. to Toronto, Michaels described what awaits them at U of T.
What follows are excerpts of his chat with U of T’s David Palmer, vice-president of advancement. You'll be struck by the manners right away. It’s hard to know what’s uniquely Canadian because Canadians talk about what’s uniquely Canadian more than any other group talks about themselves. When I went [to U of T], it was very, very conducive to learning. Also winter helps because it narrows your choices, and you’re perfectly happy to be reading a book when it’s cold and snowy. There was a tradition at University College, which was a satirical review, music and comedy. In my sophomore year, I went out for it and somehow ended up being in charge of it. I co-wrote it with a guy who went on to medical school, and I directed it. It was satirical. It was when I first had the realization that the very people that you’re making fun of are sitting out there just enjoying it. And, there’s absolutely no response other than that – because people don’t tend to see themselves as the people you saw them [as]. It was a place where there was a reverence for learning. There was nothing in my university education that had any practical application whatsoever. I was educated to be a Victorian gentleman, which presupposed that I already had money, which I did not. The things that I studied, as I said, had little practical application – 19th-century Victorian novels, philosophy courses, even a music appreciation course. They were all steeped in some notion of what it was like to learn to think, and that probably served me well – more than anything else in my education. I came out of it with at least a very, very clear awareness that there were so many people smarter than I was, and a regard for levels of intelligence and just a sense that there is so much knowledge in the world. You should dig deep into it at this time in your life because you’re not going to get that time ever again. It was a place that was just great for that. It turns out he was prescient. There were a lot of star professors in those days. I wasn’t good at taking notes, and I would try and grasp what was happening and sometimes would end up understanding. There was a very high percentage of people who were devoted to teaching, loved the subject they were teaching and made you smarter. I have a daughter who’s a freshman. I have a son who’s a senior, and I have one who recently graduated. That’s what I encouraged them to study, and I think it will serve them well. There’s only this time in your life when you can read stuff that you would never read, ever. You’re going to do it because it’s part of a course and somebody smarter than you figured out that this is the essential stuff. When you do, you feel better about yourself, and it gives you a confidence to judge whatever problems you have to judge. I’m in a situation where the president of the United States is not a huge fan of the show. Or maybe he is, we don’t know. But the point I’m getting at is, I sort of felt prepared. There was enough stuff in my education that were touchstones that I could rely on. When you do what I do, one of the things is you just know that whoever is in power, you’re against. It doesn’t matter whether they’re people you admire, don’t admire. It’s just that when they have that much power, they just have to be watched. Comedy is just one of the ways you can do that. Dana Carvey doing George H. W. Bush, or Will Ferrell the other Bush or Clinton or going back to Gerald Ford. There’s always been some sense that what we were doing was inappropriate. He’s a very heightened reality in the way he presents himself – in every way. We just happen to also be a heightened reality so we’re having more impact because of that. Again, he changes things so quickly, just because he does. So we’re throwing out something on Thursday that we thought we had on Wednesday, changing it again on Friday, and sometimes changing it again on Saturday. At a certain point, you just stop working on it, and it’s out of your hands. I think the world is a darker place right now, and I think all of that is happening pretty much everywhere – definitely Europe. It’s having ramifications here. And it’s a cloud. Do I think it’s permanent? Absolutely not. I think that comedy can do what it can do – it’s mostly a safety valve. Nothing really will do anything (unless) people get involved, and generally people get involved when they are really uncomfortable. If more and more people start to get involved in a real way as opposed to an abstract way, I think change always comes from that. I’ve had shows that clearly didn’t work. This may have had nothing to do with my education, but I tend to mostly see the mistakes. So there’s never been a time – I’ve done seven or eight hundred episodes of SNL – I don’t think there’s ever been a time when I left when I wasn’t focused on the things that didn’t work. That’s kind of the constant. I don’t know if that’s some sort of critical faculty, or some sort of notion that’s very Canadian, a sense of perspective. In terms of things that didn’t work, there’s something on SNL every week that didn’t work. Somebody once defined comedy as polite hostility, and Canada is one of those places where you can speak your mind and say things that are polite and yet not flattering, and not worry about being shot. Probably the theatre because there was a theatre, and they just let us use it. I took a student flight to Europe when I was 18 or 19, and it was the first time I was on an airplane. It was just a more innocent time so I was quite happy being in the library. I was obsessed on some level with what I was going to do when I got out of here. At some point the year before I graduated, I thought of taking a master’s or something like that only because I was perfectly happy doing what I was doing. Then, I spent a couple of months in London, and it was just intoxicating. It was the mid-sixties and change was in the air, and I thought I want to get out and see what’s out there.